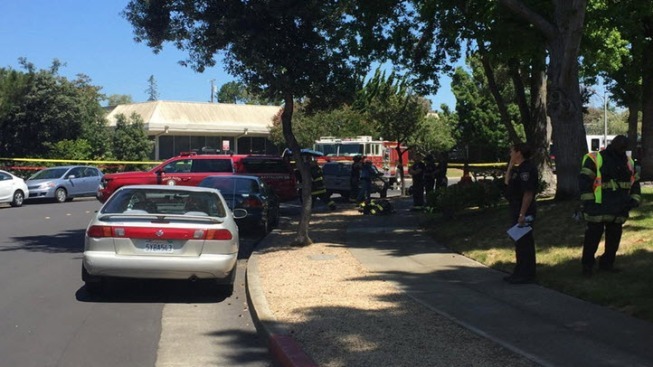 A man was sent to a hospital after he was exposed to an incorrectly mixed chemical at a manufacturing company in Palo Alto Tuesday morning, a fire official said. Firefighters responded to the incident reported at Stangenes Industries Inc. at 1052 East Meadow Circle shortly before 9 a.m., Palo Alto Deputy Fire Chief Catherine Capriles said. Two employees incorrectly mixed epoxy resin, a substance used to make the company's transformers, in a plastic bucket and caused a chemical reaction, Capriles said. They ran the melting bucket outside, where firefighters found it and called for a hazardous materials team, according to Capriles. The pair had been working on making the material inert to dispose the chemical, she said. A total of 14 employees complained of shortness of breath and abdominal pain, according to Capriles. A man was transported to a hospital for treatment and the other 13 people were treated and released at the scene, Capriles said. The hospitalized man was not one of the two employees mixing the chemical, according to Capriles. An update on his condition wasn't immediately available. About 50 employees were evacuated from the company's two-story office building and won't be allowed back in until crews finish cleaning up the chemical spill, she said. Palo Alto-based Stangenes Industries Inc. started in 1974 and operates just west of U.S. Highway 101. It designs and makes moderators, transformers and electromagnetic components, according to the company's website.